George. Where would we be without him? We wouldn’t have this blog, or a facebook page, or the upstairs run, or strawberry juice power plants, probably not even the Princelings of the East, although that really is both him and Fred. Yesterday I told you that Fred was the natural philosopher, the thinker. Well, George was The Engineer. 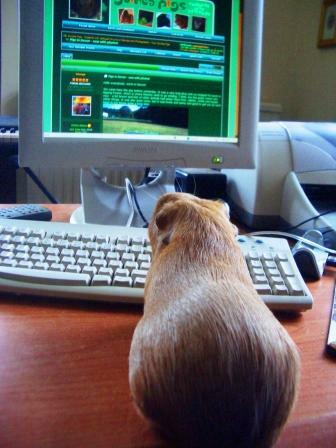 He was even the Forum Mechanic on the Rodents with Attitude forum. He took his duties very seriously, and when people asked for his advice he generally started his answers “well, I’m only a guinea pig, but…” He was very polite and very wise. So was Fred, but Fred didn’t really get into blogging and forums. Not like George. And George’s engineering genius is one of the key things (Mummy says use the word ‘cornerstones’ but I don’t know what that means) of the Princelings of the East series. You think I’m exaggerating? Well, look at the page on redesigns for grassy hutches. He did that. Have you seen the enormous run he designed, with ramps and different levels and room for lots of pigs? He did that. Vic and Dougall and I lived in for a bit, until Kevin and Colman needed it. But he designed it and he and Fred enjoyed it for a whole six months before George died. He had a lot of illness, George did. Mainly abscesses on his neck and under his teeth. He had very bad teeth. That’s why Mummy went on dental course to learn how to help him. He was so good – there are loads of pictures of him when he’s recovering from operations, still looking happy and enjoying life. He used to just lie back and let himself be wrapped up, too. I hate lying on my back. Everyone says George was the best pig anyone could ever know, and you know something – I’m not even jealous. Maybe he was. I wish I’d met him. He was indeed the best pig one could ever know. Well, maybe he’s in a tie with my Saku, who I always say is the pig by which all other pigs are judged. It doesn’t matter: they were both angels. Like his brother, he was the consummate British gentleman. Perhaps he was a bit pluckier and less reserved than Fred. I wish I’d met him, but Fred told me all about him when I visited. *Gasp* Cuteness overload! When I was a kid the neighbors had 2 guinea pigs that I babysat when they went on vacation. I desperately wanted to take them to my house, but my Mom sais no, I’d get too attached to them and pester her forever to get me one. I’m waiting till I retire, but I fully intend to have 2 or 3.